Are you worried about having guns in your home? Afraid that your cat will become too curious? I mean, curiosity did kill the cat, didn't it? How To Talk To Your Cat About Gun Safety will answer burning questions that cat owners all across the country have been asking themselves. 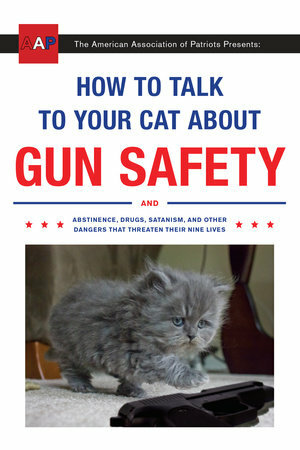 What is the right age to talk to my cat about firearms? Is it wise to teach my cat how to use a gun? I have no idea. At first I thought this book was written by an ultra-right-wing conservative trying to push their beliefs in a humerous way. But, once I got into the book and looked at their fake website, fake author bio and fake story about how these books got started I starting thinking this book is completely mocking right wingers. I guess I don't have enough of a sense of humor to get it. If I had to take a guess as to who the real author is I would go with Jack Black. I mean, why not? If you have a sense of humor and like cats then I guess this book is for you? Maybe? Try it out and let me know what you think, cause I'm lost. Especially the anti-semetic remarks, I just don't get it. Disclaimer: Thanks to Blogging For Books for providing this book for review. All thoughts expressed here are my own.